See more objects with the tag landscape, trees, floral, domestic interiors, commercial interior, forests, curtain, large repeat. See more objects with the color tan peru darkolivegreen bisque sienna or see all the colors for this object. This is a Textile. It is dated 1977 and we acquired it in 1985. Its medium is dacron polyester and its technique is screen printed on plain weave. It is a part of the Textiles department. Henry and Eleanor Kluck, the design duo known as Elenhank, drew inspiration for Forest from the northern Indiana landscape surrounding their home. When the fabric panels were hung as curtains or wall coverings, the pattern would repeat across large expanses to envelope a space as if it was a woodland glade. This is a continuation of their mural print concept of creating large scale continuous patterns. 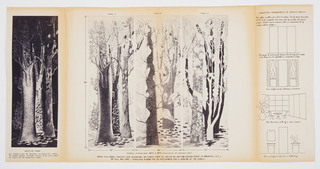 These mural prints depicted nature both abstractly, as in Rhythm (1972) or Solar (1974), and naturalistically, as in Forest and others from the late 1970s. Sketched in ink and gouache on translucent paper, this design was drawn in one-quarter scale and enlarged photographically. For this colorway, the background and flowers were hand screen printed in walnut brown and black. 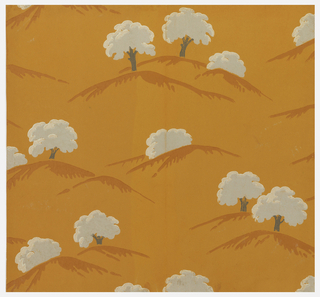 The line drawing of trees, leaves, and grass in the foreground is the white color of the fabric. 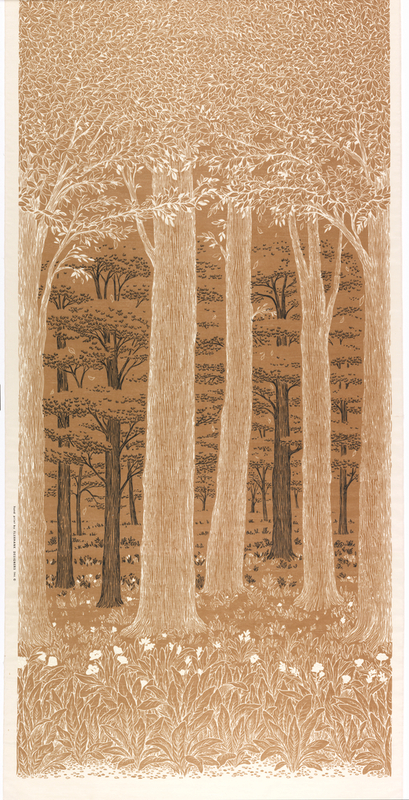 This object was featured in our Object of the Day series in a post titled A Forest for the Home. (printed in left selvedge) Hand printed by Elenhank Designers, Inc.